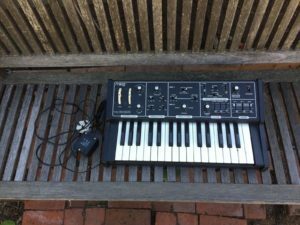 “- Used Moog The Rogue, early 1980’s monophonic analog synthesizer, 32-note keyboard and two VCOs. – Recently checked, cleaned & tuned-up by a professional service. This unit is 100% working & great sounding. 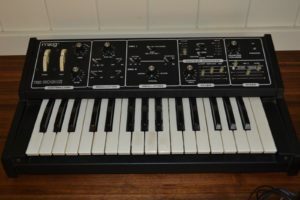 ” Moog “The Rogue” synthesizer for sale. In very good to excellent condition. Interior foam removed by previous owner. 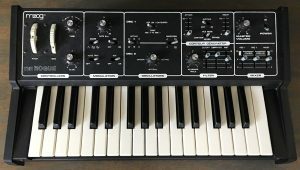 All keys, sliders, knobs and mod wheels working properly. I have only used the audio out jack so I cannot verify the condition of the others. Cosmetic condition is pretty darn good as shown in photos. Always kept covered to avoid dust. 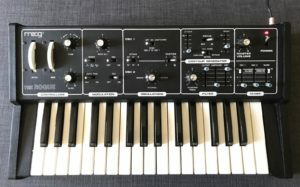 FYI, this is a “lowest-note priority” mono synth. 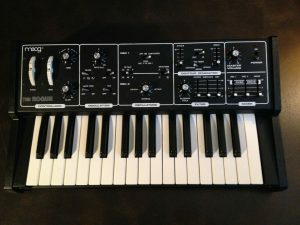 Makes cool bass and lead sounds, especially using the mod wheel. 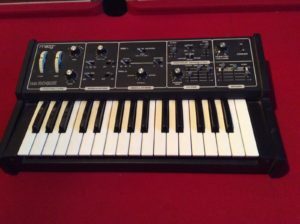 “Moog “The Rogue” synthesizer for sale. In very good to excellent condition. Interior foam removed by previous owner. 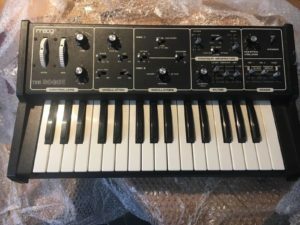 All keys, sliders, knobs and mod wheels working properly. I have only used the audio out jack so I cannot verify the condition of the others. “Similar to the Taurus II. Looks to be complete with only one changed knob cover. 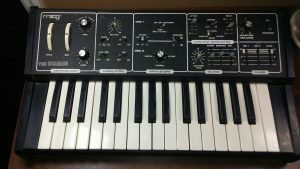 ” Vintage analog synthesizer by Moog, in excellent condition. 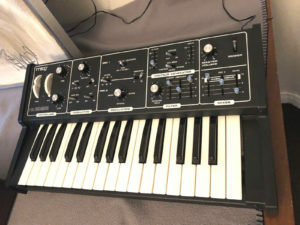 This synthesizer was used lightly in a home studio. 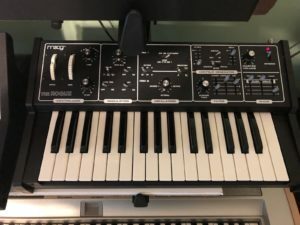 “This Moog Rogue synthesizer has recently been serviced. In great condition. Service ticket is included in the photos. The power connector is original and works, I noticed it’s fairly touchy though- not a very tight fit. Seems like it would be easy to wire a new power cord if it ever became a problem. 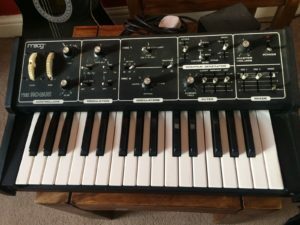 “VINTAGE MOOG ROGUE IN VERY GOOD CONDITION. 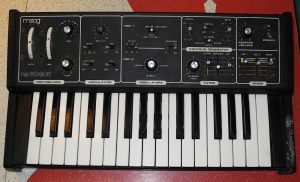 VERY GOOD CONDITION.MISSING ONE SLIDER KNOB.AC ADAPTER HAS BEEN HARD WIRED. 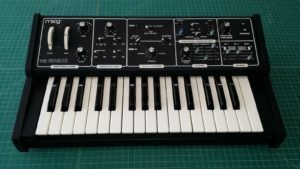 “Great little original Moog synth used for bass wap wap! “Outstanding condition! 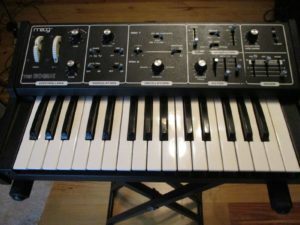 Awesome subtractive Moog analog synth from the early 1980’s. 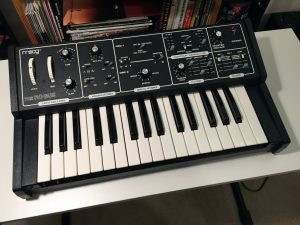 I’ve owned this synth for well over 10 years and it’s rock solid. Comes with power supply. 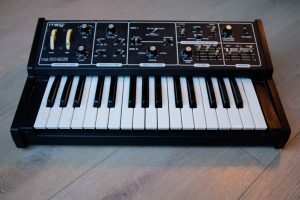 “Der kleine Minimoog in sehr gutem Zustand mit Power Supply! Eingänge für CV/Gate, klingt absolut hervorragend, in super Zustand. 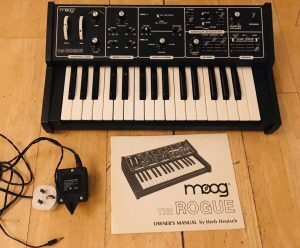 ” Here’s another piece of analog synth history, the classic Moog Rogue (one of the last mono Moogs, and one of the last models to be made all in-house). Overall working condition is great; the noise slider (in the mixer/overdrive section) is a little finicky and sometimes causes sound to cut out. 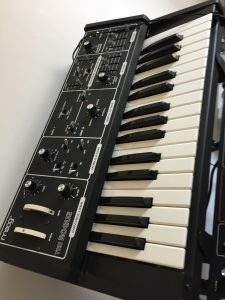 It’s probably a connection that needs cleaning and/or soldering… definitely a small fix, as I seldom have run into issues, and only when I’m live tweaking that slider. The pitch and mod wheels have some paint on them (pictured) but this doesn’t in any way affect performance. All other knobs/sliders function brilliantly. 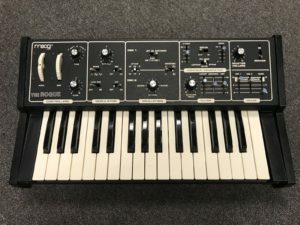 “Rare analogue vintage Moog Synth The Rogue in excellent condition! 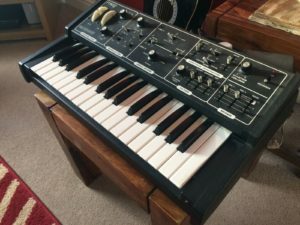 Never played live, only studio, technically and optically in very good shape. 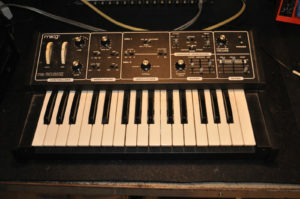 Very seldom used because there are a lot of more Moogs in the studio.